Great colander. 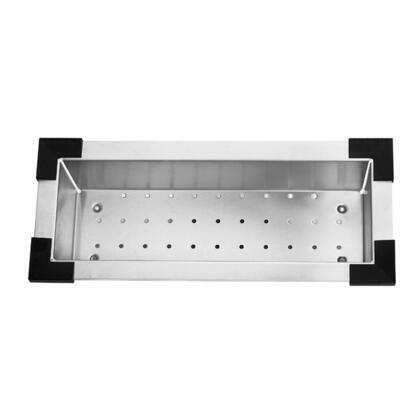 Fits the sink perfectly and is very heavy duty. Love it. in addition to the uses mentioned in other reviews I slide the colander over to the middle of my sink and place a cutting board across it - allowing all juices, trimmings and waste from prep to fall or be bushed off directly into the sink!! Then clean the board and return the colander to the side. I purchased the stainless steel colander that fits on the sink and I love it! Great quality and design! So very handy to use with the sink. Can be used as a dish drainer or colander. This is a great accessory to add function and versatility to your sink. I plan on using it for washing foods and rinsing dishes. It's almost like having a 3rd basin. I got this as part of the all in one package deal with my VIGO sink. I probably wouldn't have purchases this on it's own right away, but happy it came with my sink purchase. I will use it a ton and most likely, couldn't imagine life without it. We are very happy with our sink and colander. It is high quality and very quite. We would recommend to any one that wants a quality sink for reasonable price. Installed 5 months ago, looks amazing. Easy to clean.